Acute pulpalgia is found in three stages : incipient, moderate, and advanced. All three are related to advancing degrees of inflammation. Incipient acute pulpalgia should be completely reversible. 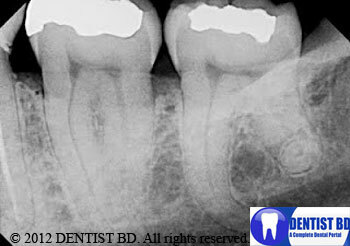 It is characterized by mild discomfort such as that experienced following cavity or crown preparation. It may be gone by 24 hours. Only radiography discloses an incipient interproximal carious lesion. In cases of constant trauma, radiographs may exhibit periodontal membrane (PDM) thickening at the apex, and percussion may elicit a mild response. Pulp tester readings are generally normal. Cold is the best stimulus to initiate the discomfort. If initial caries is the cause of the discomfort, no bacteria have reached the pulp,then first step is to remove the caries and place a calcium hydroxide dressing and sedative zinc oxide–eugenol filling until the sensation returns to normal. Then a permanent restoration can be placed. If the cause is trauma, relieving the high spot on the filling or its opposing tooth often brings immediate relief. In any event, these cases should all be reversible and endodontic therapy should be avoided. Moderate Acute Pulpalgia may be either reversible or irreversible . This is extended pain, often diffuse and hard to locate as it refers to other areas. The pain may start spontaneously or from a simple act such as lying down. If this pain has been mild and of short duration, the pulpitis may be reversible. If the pain has been moderately severe and continuous for some time, the pulp is probably infected, The pulpitis is irreversible. The pain is diffuse, and two or three teeth may give similar responses to electric pulp testing. Percussion may reveal a slight difference in response between teeth. Pain may even be referred to the opposing arch. Radiographs may reveal large interproximal caries or a deep filling impinging on the pulp (Figure ). There may be a thickening of the PDM at the apex. Thermal testing with cold should be attempted first.If pain response from the suspected tooth increases but then goes away, stop! When using the electric pulp tester, the involved tooth may respond a bit sooner than its neighbors or the tooth may be a bit more sensitive to percussion. In the event moderate pulpalgia is mild and of short duration, all the caries must be removed, and a calcium hydroxide dressing may be placed along with a thick, zinc oxide–eugenol, sedative, temporary filling. If the tooth remains symptom free for some time, a more permanent filling may be placed with the proviso that root canal therapy may have to be done if symptoms return. In case of infected pulp, one is wise to remove the pulp and clean, shape, and fill the root canal if the tooth is salvable. It is totally irreversible pulpitis. In vitality test respons to hot stimulation .One must be prepared to immediately bathe the tooth in ice water. The tooth will be responsive to percussion, but diagnostic radiography at this point is irrelevant, as is the electric pulp tester. Pulp removal either by pulpectomy or by extraction. If the tooth is salvable, pulpectomy and root canal treatment is the preferred choice. Anesthesia may be difficult to achieve, and one may have to resort to intrapulpal anesthesia. The tooth may have risen in its socket, so the occlusion should be relieved. One must be careful in doing the pulpectomy that all the pulp is removed; otherwise, the patient may be back with continuing toothache when the anesthetic wears off.